I’m here to introduce my camo plarn ditty bag. My camo plarn is made from green, tan, brown, creme, white, grey and orange recycled plastic bags. Making camo plarn is a wonderful way to use up your odds and ends of plastic bags. I used just one or two bag strips of the same color together and as I worked the ditty bag then I added more bag strips as I crocheted in an effort to create a staggered camo look. Here is my first sample of the camo plarn after 6 rounds complete of the ditty bag pattern. I used Dot’s Ditty Bag pattern found here. I did have to change the pattern a bit to make it work with recycled plastic bags. First I used a N (9 mm) crochet hook as I did in this plastic ditty bag version. My finished camo ditty bag is 7 inches tall and about 7 inches wide. Then I did another experiment and made a winter or snow camo ditty bag. For this recycled bag project, I used only black, white, and grey plastic bags. While I like both of the camo plarn bags, I think I prefer the snow camo bag best. I present my All American Plarn Recycled Bag! 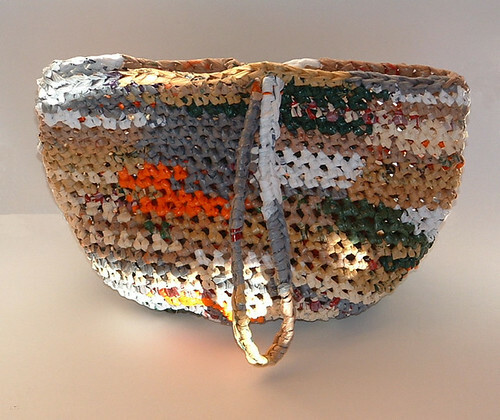 It is crocheted using red and blue newspaper bags and white grocery bags that were recycled into plarn. Here is my plarn making tutorial and I use the same method for cutting and attaching the newspaper strips together. They are much shorter strips but it’s the same loop method as regular plastic grocery sacks for making your plarn. I got these nice wooden handles from a local thrift store for just 99 cents. This is my first recycled purse project using round wooden handles and I wanted to make sure to attach them firmly to my bag. I ended up working two rows of single crochet stitches around the handles and into the bag. I have explained the process below and hopefully it’s understandable to everyone. You could work this same pattern with bulky yarn and end up with about the same sized bag. Either way I hope everyone enjoys my free crochet pattern below. Plastic bags cut into 1 inch wide plarn strips in red, white and blue. I want to share with you a unique company I came across on the web. Turtle Mat is a creator of all types of mats for the home. Not just useful by the door, Turtle Mats are now widely used in kitchens, bathrooms, boats, RVs, dorms, offices, and utility rooms. Turtle Mats are manufactured by one of the world’s largest and most eco-friendly textile groups. The group has achieved carbon negative status by planting one million trees every year and by producing green energy in its own hydroelectric plants. The group is also at the forefront of initiatives to reduce waste, cut water usage and use fewer chemicals. Turtle Mat also supports the Marine Conservation Society, the only charity in the UK dedicated to caring for our seas, shores and wildlife. Through their Adopt-a-Turtle campaign, they are working to save marine turtles from extinction. In the last year, Turtle Mat customers have helped raise over Â£5,000 through their adoption scheme. To find out more about adopting a turtle, visit their website at Marine Conservation Society. It’s nearly the 4th of July so I thought I’d post a fun stars and stripes project I did for charity. Crocheting for charity is very rewarding and enjoyable. It’s a wonderful way to give back a bit and pay it forward to someone that you may not even know. I’ve recently crocheted a few wheelchair – walker tote bags for my local nursing home. Here is one of my stars and stripes tote bags I created from some vintage bulky wool yarn I found at a thrift store. Being wool I just had to felt this and I was really pleased with the results. Felted wool just looks so cool and I think it adds a special touch to the bag. Please feel free to use my pattern to crochet for your local charities or organizations. Enjoy and I hope you have a wonderful 4th of July!